Here's more wallpaper marked Vertigo. When do we finally get past interest in reading about this one? The pic must be great for so much text it generates. I'm self-conscious dipping in a well others surely have drained, having this week Verti-gone over published content in hopes GPS won't parrot what wiser heads have writ. Three at least devoted books to Vertigo. The BFI Film Classics Series tendered Charles Barr's analysis. Then Dan Auiler gave us a "Making Of" account. Frisco locales are then-and-now'ed in a beauty called Footsteps In The Fog by Jeff Kraft and Aaron Leventhal. From such fine work does Vertigo obsession spring ... that plus fact Cinemax runs it often on HD sub-channels ... lately via "5 Star Max" with 5 AM broadcasts, for which I give thanks for salvation of DVR (how many of us used to set alarms for late, late shows? --- I even did it once to see A&C in The Time Of Their Lives). First impressions die hardest. Mine came with ABC prime-time around 1970. By then, I'd seen Rear Window, NXNW, Notorious --- so expectations ran high. The rooftop opening was this sixteen-year-old's idea of sensational --- from such sock must come Hitchcock's best. Lurching from first commercial break to endless more slowed pace beyond measure AH calculated (did he ever watch these network cleave-fests?). 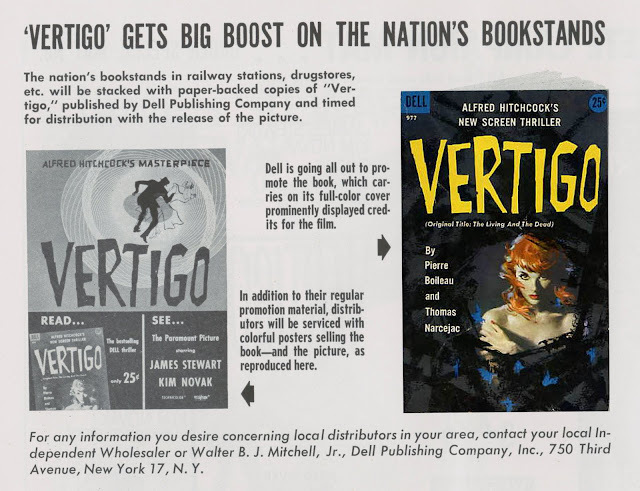 Vertigo really suffered for hawking of dog food and (back then) cigarette pitches. For over an hour, I waited for something more to happen. Was this a ghost story? That seemed untypical of Hitchcock even for one less exposed to his backlog. The finish upon belated arrival (two and a half primetime hours) left me chilly as reviewer/patrons who'd gone on thumbs-down record in 1958. I learned to like Vertigo only by going inside Hitchcock's skull via bios and deep-dishing read since. It's his "best" if you're an AH student --- in fact, to call Vertigo such is boasting insider knowledge of what drove the man --- but don't imagine you can spring the pic on general viewers, for therein might lie replay of 58's summer freeze-out. I've seen so many come away sour from Vertigo. Not a few regard me a phony for maintaining it's good, as though I were courting membership among ones who "get" the Master's masterwork. Always instructive is going back to first-run reactions. Too often we dismiss these as proof of unawareness and lack of sophistication --- wasn't it the repressed 50's, after all? My guess is that Paramount sales did panic on receipt of this oddest-duck among Hitchcocks. 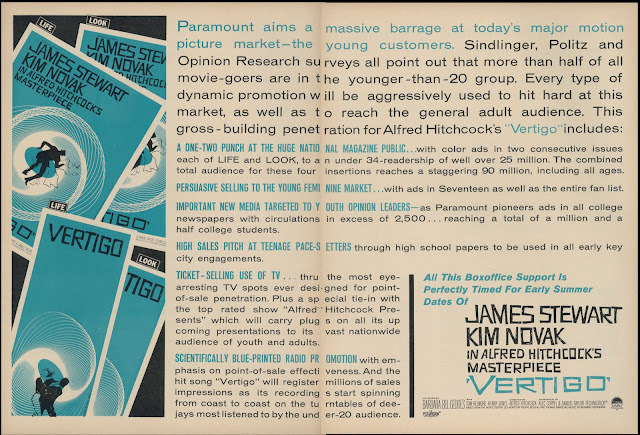 A first strategy was to sell hard to youth (52% of theatre patrons are under 20 years of age, said Para to trades), so there were ads blanketing college and high-school newspapers. Teen Pace-Setters included girls who read Seventeen magazine, so issues of the latter were salted ... all in service to frankly twisted expression of icky old men both behind and in front of cameras stalking romantic prey. Teenagers hated it, reported showman Jim Fraser of Red Wing, Minnesota ... this in addition to exhibs who said Hitchcock was losing his touch and Vertigo was "too arty." That last played like a chorus among lay critics trading (hopefully) tickets for coin. That's not me calling Vertigo icky, but I'll bet the word passed lips of many a junior miss exposed to overage Jim Stewart playing out his director's singular vision. The latter would click when served with scares two years later in Psycho --- this time out, and sans humor or suspense set-pieces, there was no buffer twixt viewers and Hitchcock's morose take on losing at love. I tried watching through eyes of Paramount's (if not Hitchcock's) target audience. After all, if you weren't reaching kids in 1958, neither would you reach break-even. Vertigo was maybe a last full-out indulgence for Hitchcock. I'm guessing its failure made him study closer what drive-inners preferred in thrillers, data he'd gather leading to all-time pay-off of Psycho. 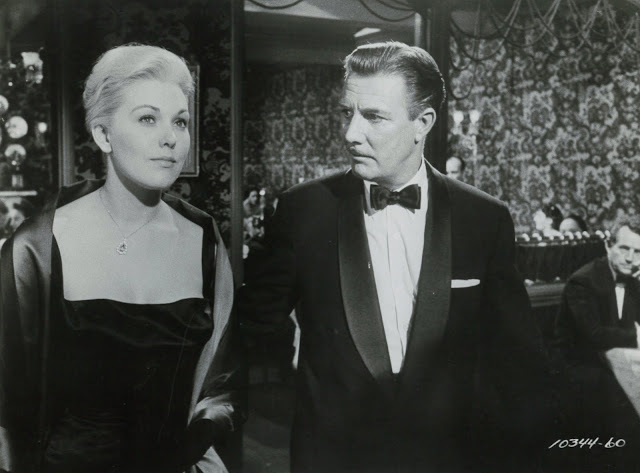 Hitchcock had always vetted scripts and casting with wife Alma. By the late 50's and his own approaching sixties, it might have profited more to follow AIP topper Jim Nicholson's example and run ideas by daughter Pat and friends. The reddest flag of my-trip-back-to youth's viewing of Vertigo was Stewart's miscasting as obsessive Scotty. The man was too old for the part as written. Exposition places him not many years out of college. Barbara Bel Geddes (b. 1922) is tendered as Jim's classmate. Now it's one thing to pair older leading men with youthful partners ... that was a 50's constant given plethora of male stars carried over from pre-war and Hollywood's failure to replenish their number afterward. But here's a fifteen-years-younger actress referring to then aged 49 Stewart as the bright young lawyer who was going to be Chief Of Police some day, admonishing his failure to recognize a brassiere she's designing with words to effect that "You're a big boy now." Scotty seems to have been in arrested development even before his rooftop ordeal. He and Bel Gedde's Midge were engaged once ... for three whole weeks, he recalls. Good old college days, Scotty murmurs --- these having taken place a good twenty-seven years before if Stewart's age and appearance is any indication. I'm still available, he says after reminding Midge it was she who broke off the long-ago betrothal. Why didn't I notice peculiarity of all this before? Could be my own distance from college makes me appreciate how strange it is that Scotty should live so fully in that past. Heck, the whole premise of Vertigo is driven by the character's circle of school buds. Gavin Elster (Tom Helmore ... b. 1904) is ID'ed as a chum Scotty remembers but Midge does not (well, natch --- in any real world, he'd have graduated eighteen classes ahead of her!). I bet none of this went unnoticed by audiences, particularly young ones, in 1958. How much it had to do with poor word-of-mouth (and this was cited as reason for Vertigo's boxoffice drop-off after a strong opening week) is anyone's guess. 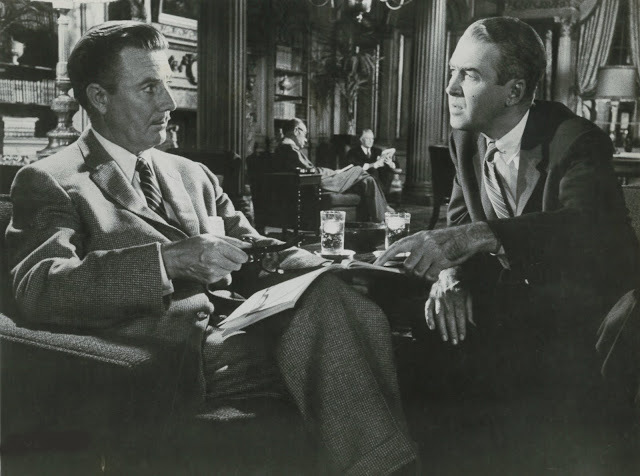 Scotty tells Gavin, I don't see much of the old college gang, which set me to thinking, Neither have I, and that was the case for a long time before reaching James Stewart's age when he made Vertigo. Did Hitchcock originally envision a younger man for his lead? That put me to wondering who he could have cast. 1958 Hollywood was barren of age-appropriate stars to enact Scotty Ferguson. I'd wish ... no challenge ... one of you reading to propose a name. The part really called for early-to-mid-thirties casting of the lead. A pre-WWII service Stewart would have been ideal, if less seasoned, for such an intense role. He could even have played it credibly after coming home in 1946, but did Hitchcock have a Vertigo in him so soon as this? I've considered and struck off names AH might have used. Most guys who made stardom after the war were still too old, or just inappropriate. William Holden, Gregory Peck, Mitchum ... all wrong for differing reasons. Younger names didn't carry their weight in gravitas. Rock Hudson, Robert Wagner, Jeff Hunter --- the very idea of these is ludicrous. What of a John Gavin or Farley Granger? --- but would either, or a Rock Hudson, let a Madeleine/Judy get so under his skin as Stewart believably does? Good as he is at delineating the character, JS was nearly as miscast here as he'd been as Charles Lindbergh in the previous year's Spirit Of St. Louis. Double whammy of these seems to me a beginning of end to Stewart's chart primacy. Hitchcock evidently thought so too --- it was said he blamed Vertigo's (comparative) failure on Jim's aging look, and it was for that reason the director chose Cary Grant instead to star in next-up North By Northwest, a part Stewart counted on till Vertigo receipts drew up short. Go to Part Two and Part Three:Conclusion, of Vertigo at Greenbriar Archive. VERTIGO - - NEVER one of my favorite Hitchcock's. But of all the names we kicked around the other day, I believe I could have accepted John Gavin in the Scotty role, even if he wasn't a "name." NO actor can play ANY role, including Jimmy. Jimmy doing NXNW instead of Cary...makes me break out in a cold sweat. Thank goodness Stewart's string of miscasting stopped before they signed him for BEN-HUR. 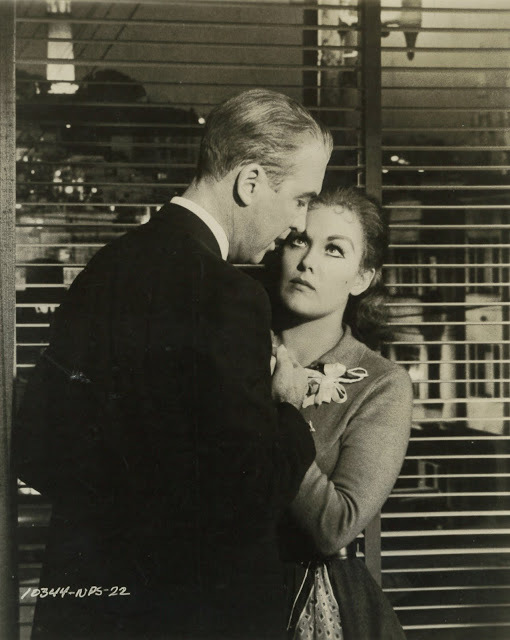 Vertigo is kind've like Kane in that it's extremely well-made and people can--and have--talk about that aspect forever, but the story itself misses the mark, especially with younger viewers. Movies more appreciated than enjoyed. I think Paul Newman could have easily taken on this role. He was about the right age for the part and had already shown a chameleon-like ability to act in quite varied roles (The Silver Chalice, Somebody Up There Likes Me, Until They Sail). Of course, Newman was not yet a household name in 1957 (that would happen by the time of 1961's "The Hustler), so he probably did not have enough box office drawing power for the money men. Still, I think he would have been great in that part. Ok...think about it before you say no....Charlton Heston. This was about the time he made Touch of Evil with Welles. Risky but I can see it working. Hi, John -- You've got me thinking about late-'50s names who weren't long in the tooth. Charlton Heston? I can see him as an old collegian, but he seems too intense and formal to go around as "Scotty." Aldo Ray? Too much of a roughneck to pass for an old collegian? Jack Lemmon? Donald O'Connor? Either might have worked, given fellow light comedian Bob Cummings's successful dramatic turn in Saboteur. Mickey Rooney? Good dramatic chops, but the opinionated Rooney going up against the equally resolute Hitchcock would have been one for the books! Glenn Ford? Van Johnson? Too shallow? What about Brando? Clift? Lancaster? Tony Curtis? Or Anthony Perkins? Hell, even Tab Hunter would be better casting for who this character is than Stewart. 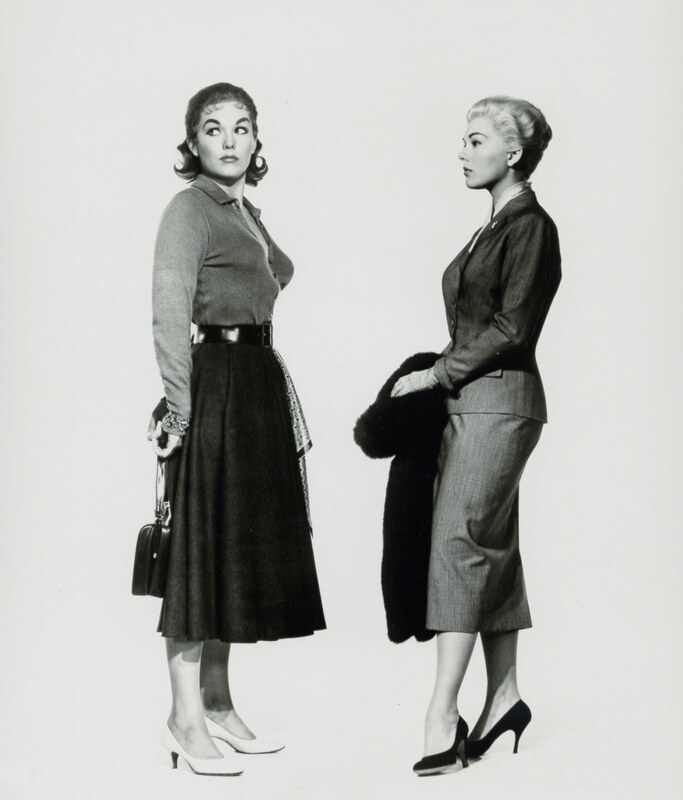 (Sorry, Jimmy) And while we're at it, how about a better actress (almost anybody) than Kim Novak? I never got this picture -- my friend Chris Steinbrunner showed me a 16 mm print and I just wouldn't go for it. Wait a minute -- the killer has murdered his wife and throws her body off the tower; but no medical examiner smells something fishy? A famous soceity woman dies ... but Stewart never sees her photo in the paper and realizes is a different woman? Also -- he walks throughout a major city and just happens to see Novak, no rendered nearly unrecognizable? Pfui! How's about Gordon Scott and Vera Miles (Mrs. Scott)? They could have even driven to the studio together. My first thought was Van Heflin, but he was only a few years younger than Stewart. Next was Arthur Kennedy. Six years younger, so still not in the right age range, but it's an interesting thought to me at least. As is Scott MacGillivray's mention of Bob Cummings. Maybe a comfortable old shoe like Stewart was necessary to try and distract the audience from the fact the story doesn't really make any sense? Sometimes a first impression is the most honest one. 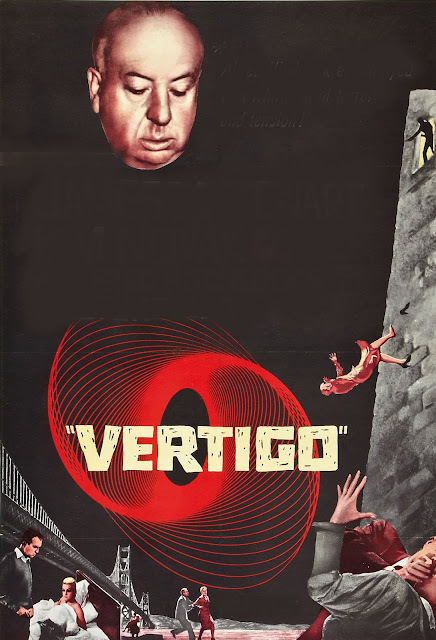 I didn't see "Vertigo" until it was re-released in 1983-84. Sitting with a receptive audience in a nice theatre watching a beautiful print in wide screen and I still found it all very silly and, what is worse, dull. Now, NXNW is silly too, but it has a sense of humor and it moves. 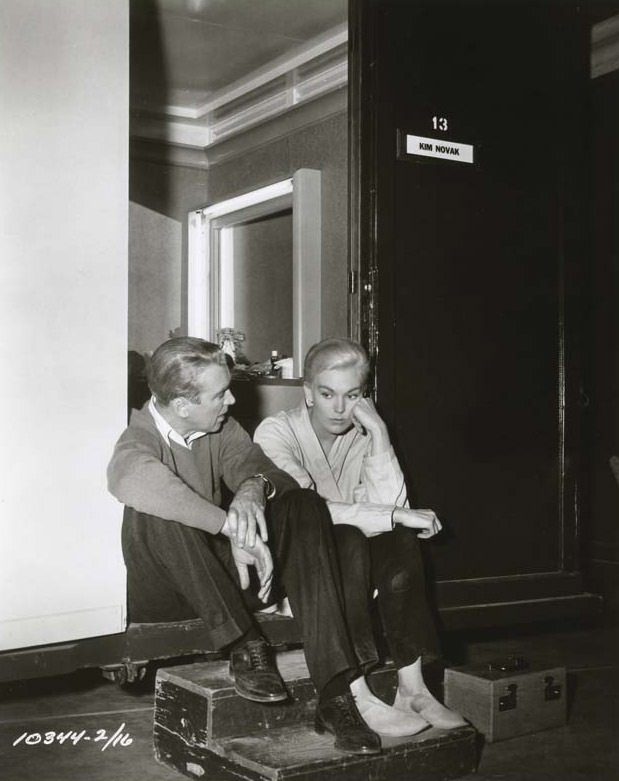 "Vertigo" moves slower than molasses and takes itself so seriously. I am baffled by the critical rapture this movie has accumulated over the years (even from David Thomson, who I thought knew better). One of the most over-rated films of all time IMHO. Some other actors who would make it better (or at least more interesting); Kirk Douglas, Rod Steiger, Cliff Robertson, John Cassavetes. And, hey, don't even get me started on the remake of "The Man Who Knew Too Much"!! Bob...your suggestion of Monty Clift. Would his facial injuries helped or hurt him in a portrayal of Scotty? Remember, he was an almost disturbingly handsome priest for Hitch in I CONFESS. One curiosity that was almost never mentioned is the fact that VERTIGO is partially based in a novel called "Bruges-la-morte" written by Georges Rodenbach. There were several versions filmed going back to silent film days, but the most important one is from 1956 and it was titled MAS ALLA DEL OLVIDO, directed and costarring Hugo Del Carril. 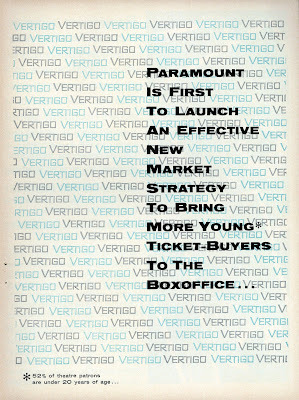 Here's the thing...I agree with all of the above criticism, and for the longest time, I gave up on watching Vertigo. I always thought it was highly improbable that a shop girl could have pulled off acting the part of a much more elegant, high society woman. For me, "Vertigo" is a pretty good film if you go into it blind. It felt like a thrill ride where you keep thinking you've gone off the rails but you're exactly where Hitch meant to steer you. And the Stewart casting works because America's favorite aw-shucks hero keeps you from dismissing his character as a complete creep -- no small feat considering how creepy he gets. Found myself thinking of another Stewart-Novak pairing, "Bell, Book and Candle." Stewart was clearly to old for that, not because he was older than Novak (whose character you suspected was a lot riper) but because the script forced him to act like a fairly clueless and short-fused young man. It COULD have been written to make Stewart's character more mature and grounded, and let him struggle to maintain THAT sensibility in the face of romantic witchcraft. Ironically, the perfect actor for Stewart's part, Jack Lemmon, was already in the film playing a rakish wizard. Stewart wouldn't have worked in the NXNW, because it was almost explicitly a cartoon of a thriller. Grant, the absurdly handsome and assured superstar who was becoming an abstraction like Bugs Bunny, was part of the joke. Stewart running through the corn (an apt metaphor) might have made us believe he was running for his life, but he'd also make us think about the absurdity of murder by cropduster. I'm going to weigh in here on "Vertigo" because, not only is it my favorite Hitchcock film, but one of my favorite movies, period. Being a hopeless "romantic" myself instead of grounded in "reality" (and believe me, that has been a curse more often than it has been a blessing!) I immediately understood what Hitchcock was saying about obsessive-love and how it can, literally, destroy you (Stewart in the sanitarium after having witnessed the "death" of "Madeline"). And that obsession leads not only Stewart, but MANY people to attempt to literally "re-make" a person in the image of the lost "loved one". How many times have we seen a person get divorced, or break-up or suffer the death of a spouse or some other loved-one to just run right back out and find someone EXACTLY like that person? Even if it was an unhealthy relationship? Or try to re-make someone into the EXACT image of the perceived "perfect" person? Only to have it backfire because perfection is in the eye of the beholder. it doesn't exist. Remember Stewart's agonized cry: "It's too late, it's too late there's no bringing her back!" When he discovers to his horror that, no only has he been "had" but "Judy" is NOT "Madeline" (because Madeline never REALLY existed)but she is an only-too-human woman. Midge (Barbara Bel-Geddes) knew this (Stewart's hopless romanticism) and that's why she dumped him. He'd always be looking for HIS version of "perfection" and sooner or later Midge just wouldn't "measure up" anymore. Forget the casting, forget the implausabilities in the story; it's the overall "arch" of what Hitch is SAYING/commenting on (perhaps his OWN personality? Didn't he LOVE "icy blondes" and cast them constantly? And if they weren't blonde he'd make them that way? )that's important here. Bernard Herrmann certainly "got it" too, being a romantic himself, he understood what the movie was trying to say and he (Herrmann) turned the film from a great film into a classic. I adore the picture. James Stewart has a role that deviates considerably from his hitherto above-reproach characterizations. Is Stewart's character (Kemp) in Mann's NAKED SPUR "above reproach"? I'd argue that the only character above reproach in that movie is the landscape. Henry Fonda might have been an interesting substitute for Stewart. There's little more for me to add to the pro-Vertigo statements here, other than... Stewart is pitch-perfect in his role. Nobody else could have pulled off such a sad, forlorn character, one that nobody seems to take seriously as a man or, for that matter, a human being (everybody calls him Scotty, as if he were a household pet). It's the very fact that he's seemingly too old for the role that deepens his portrayal. A 25 year-old can be expected to bounce back from a doomed love affair. But someone twice his age (or more)? The age difference is key to Vertigo, I believe (along with the magnificent score). It's a profoundly sad movie, almost entirely lacking in Hitchcock's mordant humor. No living director (with the possible exception of Martin Scorcese) ever put so much of his soul into a movie. The same goes for James Stewart. (Think about the actor most often compared to him -- Tom Hanks. Does he possess a fraction of Stewart's depth? )There are Hitchcock movies a lot more fun, but none more pure. And as for teenagers not "getting" Vertigo... Can't we adults have a movie to ourselves? Good points you've made here, Kevin. 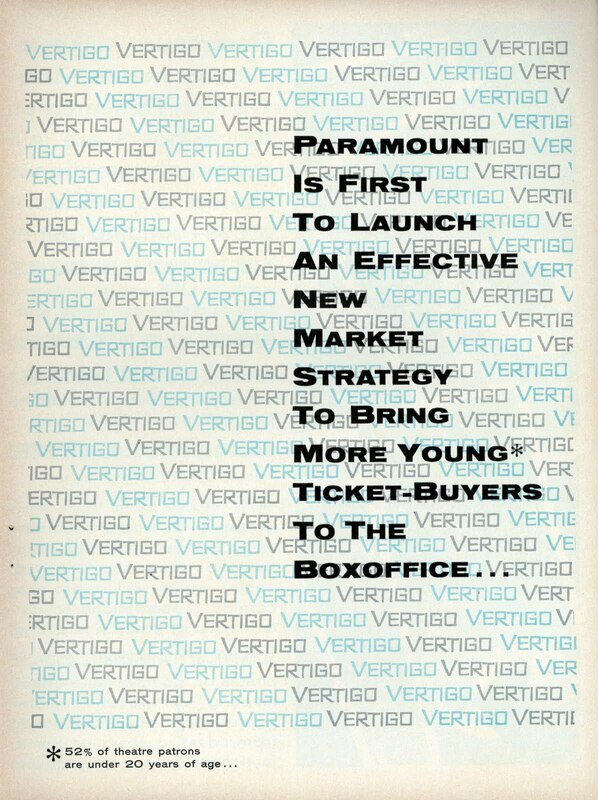 If ever there was an adult movie, "Vertigo" is it. There were a lot of older guys going to college on the GI Bill, after WW2. I'm not sure if that adequately explains Scotty's advanced years, but Stewart himself got a late start marrying and raising a family after the war. I must say that, to me, Jeffrey Hunter was a horribly underrated actor, far better than the more popular Robert Wagner, and could have done the part just fine. Nevertheless, I love the movie and enjoyed Stewart in it depsite his age. Put me in the James Corry camp, regarding both Stewart and Herrmann's importance to the film. Given BH's intense connection to the material, his late-in-life comments about the film are especially surprising: he told an interviewer that the SF setting was a mistake - he wanted a sultry climate like New Orleans - and that it should have starred "an actor like Charles Boyer" because "I don't believe [Stewart] would ever be that wild about any woman." I agree that Charles Boyer would have been terrific in this part had "Vertigo" been made earlier. And the Herrmann aspect is one I'll deal with more in Part Two. Hmmm, interesting phenomenon: the pro- and anti-Vertigo commenters here both seem to cite the same features of the movie, one group as reasons to love it, the other as reasons they don't. I've never been one of the "masterpiece" crowd myself; I like Vertigo well enough, I guess, but among Hitchcock movies it doesn't even make my top ten. Hitchcock's technique and personal obsessions mean less to me than the fact that (as I see it) the story is poorly constructed and doesn't make sense in the first place. On one point, however, Vertigo is absolutely peerless: Those of us who knew San Francisco before the skyscrapers (and the bums) took over the place remember what a lovely city was lost between 1965 and 1980. When I revisit Vertigo, it's not because I give a rat's patoot about Scotty or Madeleine/Judy (whatever she wants to call herself). It's because I miss my Bagdad-by-the-Bay. Love the pictures in your post. 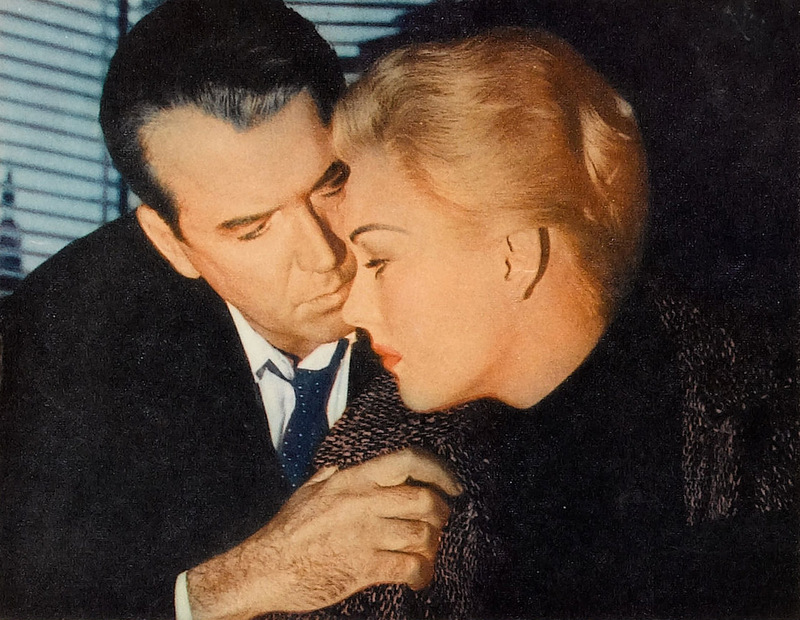 Vertigo has a lot of talk in it, especially the first 30 minutes of the film. I recently viewed Psycho again and was surprised at the amount of dialog in that film. For a director who claimed to emphasize the visual aspects of film, Hitchcock had a lot of chatter in his films. Vertigo is a masterpiece. And the original book ain't half bad either. It is set in occupied France, and that makes the atmosphere even more disquieting. "L'amour fou" never was portrayed better than this. Reading these comments, it hit me that maybe it's best to go into Vertigo like it's some Italian giallo films. It looks great, has a dreamlike quality, there may be something supernatural going on.... just check your logic at the door. Love the masthead for today (7/6)!! The one sheet poster for 1960's "House of Usher" that the art is taken from is one of the coolest movie ad designs of all time. Nice re-working of the original by Reynold Brown. I know he did the drawings, but did he also do the lay out? Did Nicholson or Arkoff or Corman rough out what they wanted for these posters or was it some now forgotten worker in AIP's publicity department? Somebody got lucky and created a classic. The internet is full of stories that state hitchcock blamed stewart for vertigos lackluster reception and hitch thought jimmy was too old.They also like to say that hitchcock never worked with stewart again.The truth is that after psycho AH gave jimmy a script entitled the blind man.Since psycho was 1960 and the only film jimmy did in 1960 was two rode together,I can only assume jimmy chose the western where age was less of a problem and the opportunity to be raked by ford.The blind man was complicated and more farfetched than vertigo with jimmy's character getting eye transplants of a dead man then seeing through those eyes how the owner of those eyes was murdered.Still for liberty valance and the cinerama HTWWW,jimmy must have been playing thirty years old at age fifty four and fifty five. Some really interesting comments here. To me, VERTIGO is a flawed film, and I don't revisit it much. Yet...it sticks in the mind. It really seems to exist in its own world. Some of the images--I've never gotten them out of my head. Can't say that about the latest Batman movie, or whatever. The truth is that after psycho AH gave jimmy a script entitled the blind man. Since psycho was 1960 and the only film jimmy did in 1960 was two rode together, I can only assume jimmy chose the western where age was less of a problem and the opportunity to be raked by ford. The blind man was complicated and more farfetched than vertigo with jimmy's character getting eye transplants of a dead man then seeing through those eyes how the owner of those eyes was murdered. Like Orson Welles' "The Smiler With A Knife," that sounds like one of those scripts that someone, somewhere, should revive. Perhaps it wasn't much at all, but on the surface, it sounds tantalizing. I envision an alternate universe where Stewart does "North By Northwest" and Cary Grant does "Anatomy Of A Murder." That universe's 1959 filmdom would be nowhere as attractive as ours. I have always loved this film; the mystery; the overall aura of fantasy, romance, and loss. And of course the music. It's a score I come back to repeatly. About the alternate ending, I took think it would have totally changed and lessened the film, and shattered the obsessive feeling of longing that pervades the movie. Apparently, the sound did not survive for this scene. It appears to contain a newly-created effects track (like the rest of the restored version), and, unless my ears deceive me, is that not the voice of restorer Robert Harris as the radio newscaster? I am a woman and Vertigo is my favorite movie. I grew up in Northern California, have made many trips to the redwoods and San Juan Bautista.